Click above to register online, or call 202-638-5555 to register. Thursday, November 6, 2014 - 8:30am at the SVA Theatre in New York. Call it digital marketing, digital storytelling, or immersive experiences. No matter the terminology you use to describe it, digital technology is dramatically changing the way people interact with public spaces and each other—and it’s driving how brands, institutions, and designers shape customer experience. What are the latest technologies that you should consider incorporating into the stories, media, and places you design? Why should you care about how sensors are leading users to more intelligent interfaces? What are iBeacons? How can you create interactions that are more responsive to human behavior, tell engaging stories, and create memories? 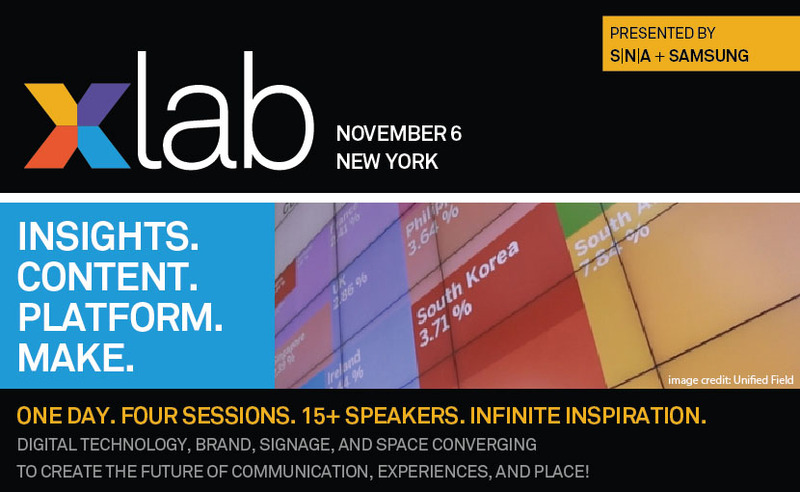 Those are the questions we’re tackling at Xlab 2014, the innovation forum designed to bring designers, technology integrators, thinkers, makers, and brands together to survey the changing landscape and identify challenges and opportunities in customer experience design. 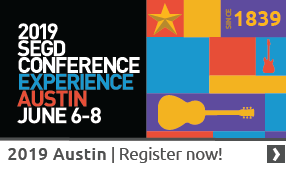 There’s a lot to cover, so we’ve invited the world’s top experiential and interactive design firms to headline rapid-fire, 10-minute presentations focused on new interfaces, media, content models, platforms, and collaborative approaches to immersive customer experience. Join us November 6 at the SVA Theatre in New York! What will the platforms of the future need to do, and how will Experiential Graphic Design respond to these problems? 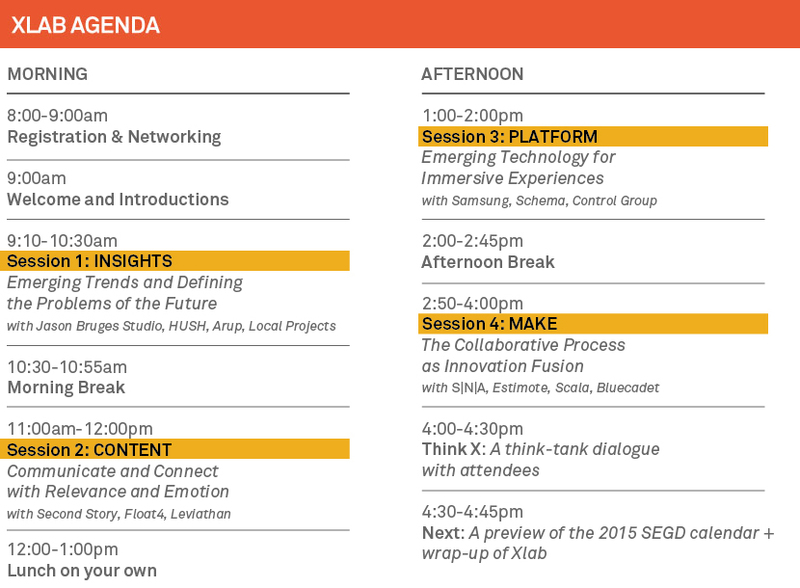 This session will focus on the ideas and insights that leading professionals are developing for the interfaces and experiences of the future, and how we’ll interact with them in everyday places. In this session, our panelists will discuss their respective focus areas of experiential installation, public-facing and institutional projects, and brand storytelling. We’ll dive into how their projects have taken shape through the collaborative vision of their teams and their clients, and how they’ve shaped the user experience. Experiential projects can range from interactive art installations using algorithmically generated content to specific stories crafted by carefully curated images. How are these projects changing the way architecture and cities connect with people? Experiential design can function as the nexus for brand storytelling. How can the blending of interactive experiences with foundational design shape a unique relationship between product and brand? Truly immersive experiences go beyond the visual—they encompass all sensory elements shaping space with highly calibrated acoustics and high performance audio systems. How can sound be used in new and innovative ways that create a truly performative and dimensional experience? Cultural institutions have instigated a new exchange and dialogue with visitors. How have technology and the way we experience stories about place shifted the public perception of museums, memorials, and, collective memory? Content is the heart of media-centric experiences. Without the content, the story, and the information, there is nothing but surface and space. The most significant shift for Experiential Graphic Designers in the coming years will be the opportunity to not only lead visually, but to drive the messaging and communication strategy integrated into immersive experiences. As the platforms for telling stories change, so will the way we tell stories. User-generated content and two-way responsive communications allow stories to evolve, expand, and be continuous like never before. Learn from the content makers and storytellers who are changing the way we connect with each other. Experiential design has added a visceral dimension to the shaping of content: How do we engage the whole body in the experience of a story? How does the added dimension of our own physicality, our senses, influence our relationship with content? The process of aligning content to interactive methodologies has changed due to shifts in new interface technology. How is content being developed in relation to these new platforms and conversely how does the method of interaction affect the content? All content begins with a concept. The process by which we navigate and develop ideas—from the initial pitch to aligning to technical requirements—requires continual focus on the Big Idea and of course the end experience. How do you successfully apply art and storytelling to create innovative media installations? This presentation will rekindle your passion for craft, renew your love for conceptual thought, and inspire your team to charge forward creating the future. The landscape of technology is evolving at a rapid pace. Media screens, materials, and surfaces are being added to the built environment, and new and emerging technologies that are more customizable, integrative, and ambient are being added to immersive experiences. Sensors and responsive networks that track, adjust, and provide feedback to performance and human interaction are changing the way we consume and interface with dynamic systems. This session will include the experts who are developing and innovating these platforms, and will provide insights to designers and content makers who are shaping their stories to be a part of this. As displays continue to evolve and become more integral to creating and shaping space, how are the ways that users are connecting to these systems changing our work strategies, business models, and every day way of life and experience of space? Mobile and wearable technology is changing the way we interact with and experience the physical environment through contextual information. How are new applications and devices changing the way we design and development for those platforms and ultimately the way we view the world? As the emergence of the Internet of Things continues to bring digital experiences to the physical world, the process for developing new interfaces and experiences continues to become more complex. How will customers now navigate these future interfaces? What will the impact on our experiences be as we evolve from keyboard to touch to gestural interface? The collaborative process is the heart of making immersive experiences possible. Designers, technologists, integrators, and product developers know that in order to create incredible experiences the boundaries will be blurry, and the process will at times be organic. It’s time to work together, find out what works, and learn how to make our own ideas possible. Let’s make your vision happen! Digital display suppliers and manufacturers often customize firmware to fit customer and designer needs, custom-engineer hardware to properly integrate an LED space as designed, work with content managers to ready their system, work with installers to familiarize them with the technology and installation requirements, and much more. The discussion will be an overview of this collaborative process, from working with designers and architects up front to installing the final piece of hardware, and will include how project teams are often structured. Post Xlab networking in the city! Dramatic placemaking and digital technology combine to shine new light on Cleveland, Ohio’s, historic theater district. Cleveland’s Playhouse Square theater district has been a major part of the city’s heritage since its Vaudeville houses and movie palaces first thrilled theatergoers in the early 1920s. NEW YORK (25 Sep 2014) — For designers practicing in visual communication, the built environment, or consumer brands, the world is changing fast. New technology platforms, improved interfaces, and innovative content models create an evolving landscape of experience design. 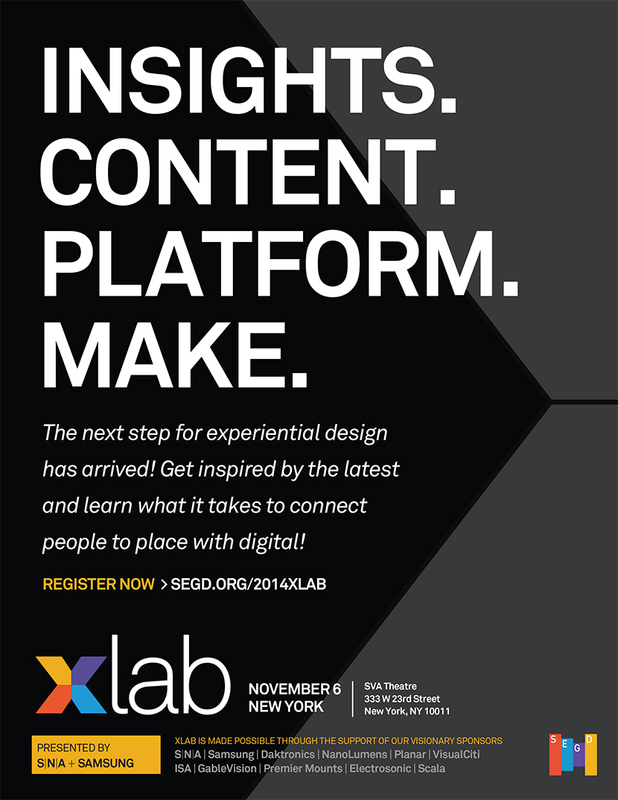 SEGD’s Xlab 2014—happening November 6 at the SVA Theatre in New York—will bring together the top experiential design studios in the world to talk about how digital technology is transforming built environments and changing the way we connect with one another. NEW YORK (8 Sep 2014) — Call it digital marketing, digital storytelling, or immersive experiences. No matter the terminology used to describe it, digital technology is dramatically changing the way people interact with public spaces and each other—and it’s driving how brands, institutions, and designers shape customer experience.